Amnesty USA: Political prisoners in Iran, including prisoners of conscience, are routinely subjected to inhuman and degrading prison conditions, including overcrowding, poor food and water, dirty and unsanitary facilities, and medical neglect. Many of them suffered severe injuries as a result of torture in custody that have never been properly treated while many others contract chronic and debilitating ailments including kidney and lung infections. Political prisoners, who seek medical leave to enable them to receive urgent or specialized medical care, as permitted under Iranian law, often see their requests arbitrarily rejected and appear to be routinely discriminated against by the prison administration. Blogger Hossein Ronaghi Maleki was arrested on 22 August 2012 when police and plain-clothed security forces reportedly attacked a relief camp in East Azerbaijan province where he and others were offering supplies for earthquake victims. Hossein Ronaghi Maleki had been sentenced to 15 years in prison after an unfair trial in 2010 on charges including “membership of the [illegal] internet group ‘Iran Proxy,’” “spreading propaganda against the system” and “insulting the Leader and the President,” apparently in connection with articles he posted on his blog, 14 Tir. When he had complained of being tortured, the judge at his trial told him that he “deserved it.” He had been released from prison on 2 July 2012 to receive needed medical treatment for his serious kidney condition, upon payment of a large sum of money for bail. He has now been charged with “distributing unclean and non-hygienic goods” and is reported to have been tortured during questioning. He was reportedly beaten so severely in the kidney area that the wound from his recent surgery started bleeding. On 4 November 2013 Hossein Ronaghi Maleki was transferred to Tehran’s Hasheminejad Hospital but was taken back to Evin Prison after only three hours and without receiving the treatments he requires. Reports indicate that doctors have diagnosed him with a kidney infection in his one remaining kidney, as well as a condition called Hydronephrosis, where the kidney becomes stretched and swollen as a result of a build-up of urine inside the kidney. Hossein Ronaghi Maleki needs ongoing specialized treatment on his remaining kidney, which he cannot get in prison. Since his arrest, he has launched a number of hunger strikes in protest at the authorities’ refusal to grant him medical leave, their harsh treatment of political prisoners, and disregard for prisoners’ welfare, have resulted in further deterioration of his health. Hossein Ronaghi Maleki’s mother, Zoleikha Mousavi had launched her own hunger strike on 20 August 2013in protest at the authorities’ refusal to release her son. His hunger strike prompted letters from dozens of political prisoners and hundreds of journalists, academics and civil, political and human rights activists to the Iranian authorities, urging them to release him. Former president, Mohammad Khatami, also wrote a letter asking Hossein Ronaghi Maleki to end his hunger strike and expressing concern that the constraints and restrictions on Iranian people still continue today. Ayatollah Hossein Kazemeyni Boroujerdi, age 55, a dissident cleric and prisoner of conscience detained in the Special Clerical ward at Evin prison, is suffering from various illnesses and has been prohibited from receiving medical treatment. He has served seven years in prison and has never been given any furlough from prison. Ayatollah Boroujerdi advocates the separation of religion from the political basis of the Iranian state. He was arrested at his home in Tehran on October 8, 2006, along with more than 300 of his followers. He and some of his followers were initially sentenced to death after an unfair trial in Branch 3 of the Special Court for the Clergy in June 2007, although his sentence was commuted in August 2007 to eleven years in prison. In addition to this, Ayatollah Boroujerdi was also defrocked (banned from wearing his clerical robes and thereby from practicing his clerical duties), and his house and all his belongings were confiscated. He had reportedly been found guilty of at least 30 charges, including “waging war against God” (moharebeh); acts against national security; publicly calling political leadership by the clergy (velayat-e faqih) unlawful; having links with anti-revolutionaries and spies; and using the term “religious dictatorship” instead of “Islamic Republic” in public discourse and radio interviews. Ayatollah Boroujerdi has reportedly been tortured and otherwise ill-treated on numerous occasions since his arrest. He is said to have been beaten, thrown against a wall, and had cold water thrown on him when he was sleeping. He suffers from a heart condition, pulmonary issues, diabetes, severe problems with his eyes including untreated cataracts, and kidney stones. His legs are swollen which makes it very difficult for him to walk. His hands also shake as a result of his Parkinson’s disease. While in detention, he has not been receiving necessary medical treatment and has lost a considerable amount of weight. He was reportedly attacked and beaten in prison on 17 November 2013, perhaps as a result of letters he wrote that have been published on various web sites. 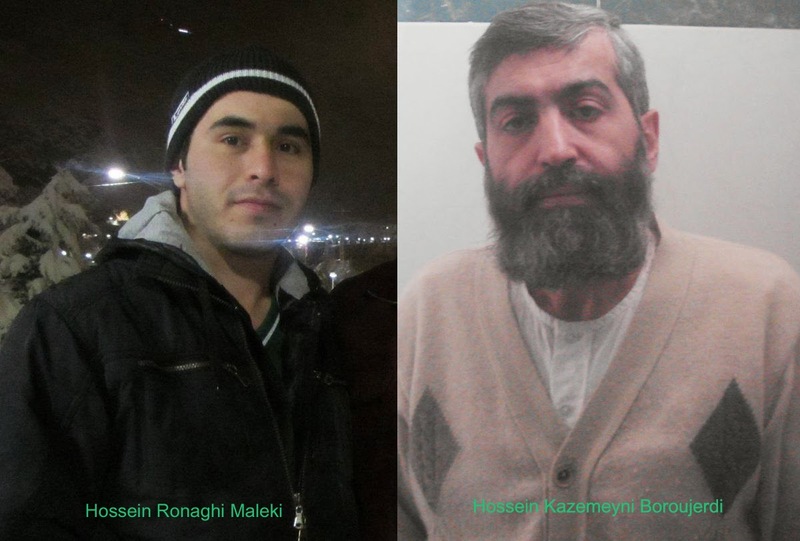 I am writing to you to express my concern over the situation of two prisoners of conscience, Hossein Ronaghi Maleki and Hossein Kazemeyni Boroujerdi, who are seriously ill and in urgent need of proper medical care, which they are not receiving in prison. Blogger Hossein Ronaghi Maleki is serving a 15-year prison sentence imposed after an unfair trial in 2010 on charges including “membership of the [illegal] internet group ‘Iran Proxy,’” “spreading propaganda against the system” and “insulting the Leader and the President,” apparently in connection with articles he posted on his blog, 14 Tir. He had one kidney removed already and needs specialized treatment for a severe infection of his remaining kidney. Ayatollah Hossein Kazemeyni Boroujerdi has been in prison since his arrest in October 2006 and has not received a single medical furlough. He is serving an 11-year sentence for having peacefully expressed his opinion about the separation of religion from the political basis of the Iranian state. He has been subjected to brutal mistreatment in detention and suffers from a variety of ailments including a heart condition, pulmonary issues, diabetes, severe problems with his eyes including untreated cataracts, drastic weight loss and kidney stones. His legs are swollen which makes it very difficult for him to walk. His hands also shake as a result of his Parkinson’s disease. The failure to provide adequate medical care to vulnerable prisoners is a breach of international human rights standards, including the prohibition against torture and other ill-treatment under the International Covenant on Civil and Political Rights, to which Iran is a party. The UN Standard Minimum Rules for the Treatment of Prisoners also states that prisoners who require specialist treatment must be transferred to specialist institutions or civil hospitals. Equipment and pharmaceutical supplies in prison medical facilities are required to be proper for the medical care and treatment of sick prisoners. Iran’s own prison regulations require that prisoners who are suffering from serious medical conditions that cannot be treated inside prison, or whose conditions will worsen if they stay in prison, be granted medical leave in order to receive treatment. I urge you to ensure that Hossein Ronaghi Maleki and Hossein Kazemeyni Boroujerdi are treated humanely in prison, and that they be granted medical furloughs to receive appropriate medical treatment, if such treatment cannot be provided to them while they are in prison. Furthermore, both are prisoners of conscience and I also urge that they be immediately and unconditionally released from prison and that their sentences be overturned.